With the Live calls dashboard, team managers can see at-a-glance all ongoing calls, listen in on agent conversations and barge in on calls when agents need support or escalation. Administrators and custom roles with System > Can manage channels and extensions permissions (see Agent permissions) can access the Live calls dashboard. Users with only the Channels > Can view Zendesk Talk dashboard permission cannot monitor calls. Users with the correct permission who don't have a Talk Agent seat can view the dashboard but not interact with calls. 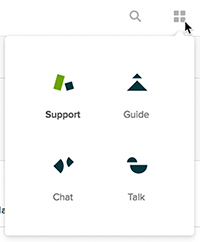 Note: If you and your team are using the call monitoring feature of Zendesk Talk, ensure that your custom greetings provide adequate notice in accordance with your state or country's telephone recording laws. Default greetings created before call monitoring was launched on March 14th, 2017, do not alert callers that their call may be recorded and monitored. From the product tray, select Talk. 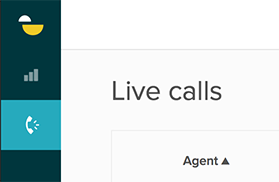 In the new tab that opens, select the Live Calls icon in the sidebar. Filter by agent or group name using the search field in the upper right. To monitor a call without the agent or caller being notified, click Listen. Note: Only one agent can listen to a call at a time. Click Barge to join the call. The agent and caller will both hear a beep notifying them a third party has joined. Note: Only one agent can barge into a call at a time. The original agent must remain on the call; if they disconnect, the call will end. Click End barge to leave and return to Listen mode. Click Leave call to end Listen mode. Click the Export Monitoring CSV button. Does this feature work with agent forwarding? If I understand your question correctly then yes it works. If you are monitoring a call and that call is transferred to another agent or forwarded to an external number, you can continue to monitor the call until it has ended. I want to allow agents to have this feature, but don't want to give them the ability to manage all of the channels. Currently custom roles forces this. Can this be broken off in custom roles better? Thanks Jenny! You've answered my question. This is a request we are hearing more and more, currently there is only 2 role you can give your agents and that is manage channels or admin. We are looking into how we assign our roles at a more granular level but this will be a bigger project in the future and not just tied to Call Monitoring. One of the primary reasons why we were excited about this feature is to help our Tier 1 agents learn from our Tier 2 agents by listening in on the call after it has been transferred through call monitoring. I really need to be able to assign more granular permissions beyond "Agent" and "Admin". I would like to use this feature for internal training, but I do not want to give all "staff" access to manage the channels. Is it somehow possible to allow the staff agents to listen to live conversations with out being af team leader or admin? Thanks for getting in touch, this is consistent with other feedback we have heard. We understand the need to have more granular permissions by feature and/or by role. It is something we are actively looking at introducing into the product. I don't have any dates to share with you at this point so please bear with us. As soon as I have an update I will post it here. There is also functionality to put the caller on hold, but we haven't figured out how to return back to the call from the dashboard? Jenny, any updates on changes to the access levels for live listening? We are looking for a solution for buddying/ side by side call listening, and it has been suggested to us to have agents do live listening. This is impractical if we are giving such high access to brand new agents or having to create zendesk users just to listen to calls. This work is still on our backlog and I do understand the need but unfortunately the work has not been prioritised as of yet. The only work around we have to offer you at this point is to give your agent manage channel permission but I realise the concerns you might have around that. Alternatively the other option for now is to use a splitter on your head sets. I'm sorry I don't a better update for you. This article describes a feature which is NOT available in 'Professional' (as far as I can see). The Can view Zendesk Talk dashboard permission seems to be an 'Enterprise' only feature. But: it should be in Professional, as in a large enterprise it usually is not common to allow every agent to see the full list of agents, statistics and Benchmarks. It could (like in Germany) even be legally difficult to allow this. I assume this restriction was indeed meant to be available in 'Professional'.